Back in the day, lushes in Chicago could booze it up, get grub to soak it up and—if that failed—get a room for the night under the same roof. 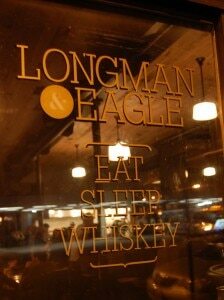 Reviving the tradition: Longman & Eagle, a vintage-inspired saloon with rough-hewn-chic vibe. It’s from the folks behind The Empty Bottle, Mode Carpentry and Struggle Inc., and it’s rolling out the first phase—a seasonally minded gastropub—January 20. Jared Wentworth, fresh from Quinn’s in Seattle, is in the kitchen, and his menu has us enamored at first glance. First up are small plates like a wild boar sloppy Joe with crispy sage, onion and pickled jalapeño and smoked sweetbreads with salsify, roasted beets and brown butter applesauce. Using willpower, we’ll save room for the charmoula-spiced tuna loin (the pairing of cannellini bean ragout and black trumpet mushrooms in foie broth sounds too good to pass by).